Keeping your yard lush and green through the hot Georgia summer can seem like an uphill battle, but it doesn’t have to be. With a little bit of work and a few handy tricks, you can keep your lawn lush, green and beautiful all summer long. Watering seems straight forward, but you want to make sure you’re getting the most out of the water you give your grass. Avoid watering during peak sun hours. Watering early in the day and before it gets too hot allows the water to get down into the soil and root system. If you have an irrigation system with a timer, make sure you set the start time between 6 a.m. and 9 a.m. and let it run for 30 minutes. Mowing is an essential part of keeping your grass healthy, but it can also be mildly stressful for your lawn. Mowing during the hours of peak heat can compound the stress and effect the overall health of your lawn. It’s also important to make sure you don’t cut your grass too short. St. Augustine grass and other similar species commonly found in Georgia should never be cut lower than 3-4 inches. Your best bet is to set your mower blade to the highest possible setting and mow your grass once a week at most. Insects kill more lawns than possibly anything else. And while insecticides are an important factor in keeping your yard green, there are a lot of different options to choose from. At Alternative Environments, we can help you find the perfect solution for your yard, whether you want an organic method, eco-friendly sprays, or pellets. 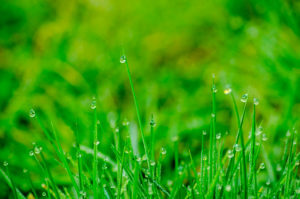 For more information on how to keep your grass vibrant and beautiful all year long, give us a call today!